Turkish literature (Turkish: Türk edebiyatı or Türk yazını) is the collection of written and oral texts composed in the Turkish language, either in its Ottoman form or in less exclusively literary forms, such as that spoken in the Republic of Turkey today. The Ottoman Turkish language, which forms the basis of much of the written corpus, was heavily influenced by Persian and Arabic and used a variant of the Perso-Arabic script. The history of Turkish literature spans a period of nearly 1,500 years. The oldest extant records of written Turkic are the Orhon inscriptions, found in the Orhon River valley in central Mongolia and dating to the eighth century C.E. Subsequent to this period, between the ninth and eleventh centuries, there arose among the nomadic Turkic peoples of Central Asia a tradition of oral epics, such as the Book of Dede Korkut of the Oghuz Turks—the linguistic and cultural ancestors of the modern Turkish people—and the Manas epic of the Kyrgyz people. Beginning with the victory of the Seljuks at the Battle of Manzikert in the late eleventh century, the Oghuz Turks began to settle in Anatolia, and in addition to the earlier oral traditions there arose a written literary tradition. Its themes, genres, and styles issued largely from the Arabic and Persian literary traditions. For the next 900 years, until shortly before the fall of the Ottoman Empire in 1922, the oral and written traditions would remain largely separate from one another. With the founding of the Republic of Turkey in 1923, the two traditions came together for the first time. Throughout most of its history, Turkish literature has been rather sharply divided into two rather different traditions, neither of which exercised much influence upon the other until the nineteenth century. The first of these two traditions is Turkish folk literature, and the second is Turkish written literature. the basic structural unit of folk poetry became the quatrain (Turkish: dörtlük) rather than the couplets (Turkish: beyit) more commonly employed in written poetry. 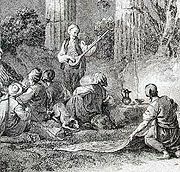 Furthermore, Turkish folk poetry has always had an intimate connection with song; most of the poetry was expressly composed so as to be sung and so became to a great extent inseparable from the tradition of Turkish folk music. In contrast to the tradition of Turkish folk literature, Turkish written literature prior to the founding of the Republic of Turkey in 1923 tended to embrace the influence of Persian and Arabic literature. To some extent, this can be seen as far back as the Seljuk period in the late eleventh to early fourteenth centuries, where official business was conducted in the Persian language, rather than in Turkish, and where a court poet such as Dehhanî, who served under the thirteenth century sultan Ala ad-Din Kay Qubadh I, wrote in a language highly inflected with Persian. Persian- and Arabic-based words were brought into the Turkish language in great numbers, as Turkish words rarely worked well within the system of Persian poetic meter. Out of this confluence of choices, the Ottoman Turkish language, which was always highly distinct from standard Turkish, was effectively born. This style of writing under Persian and Arabic influence came to be known as "Divan literature" (Turkish: divan edebiyatı), dîvân (ديوان) being the Ottoman Turkish word referring to the collected works of a poet. Just as Turkish folk poetry was intimately bound up with Turkish folk music, Ottoman Divan poetry developed a strong connection with Turkish classical music, with the poems of the Divan poets often used as song lyrics. Turkish folk literature is an oral tradition deeply rooted, in its form, in Central Asian nomadic traditions. However, in its themes, Turkish folk literature reflects the problems peculiar to a settling (or settled) people who have abandoned the nomadic lifestyle. One example of this is the series of folktales surrounding the figure of Keloğlan, a young boy beset with the difficulties of finding a wife, helping his mother to keep the family house intact, and dealing with the problems caused by his neighbors. Another example is the rather mysterious figure of Nasreddin, a trickster who often plays jokes, of a sort, on his neighbors. Nasreddin also reflects another significant change that had occurred between the days when the Turkish people were nomadic and the days when they had largely become settled in Anatolia–the conversion to Islam. Nasreddin is a Muslim imam. The Turkic peoples had first become an Islamic people sometime around the ninth or tenth century, as is evidenced from the clear Islamic influence on the eleventh century Karakhanid work the Kutadgu Bilig ("Wisdom of Royal Glory"), written by Yusuf Has Hajib. The religion henceforth came to exercise an enormous influence on Turkish society and literature, particularly the heavily mystically oriented Sufi and Shi'a varieties of Islam. 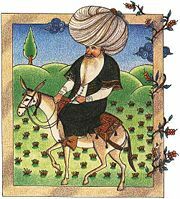 The Sufi influence, for instance, can be seen clearly not only in the tales concerning Nasreddin but also in the works of Yunus Emre, a towering figure in Turkish literature and a poet who lived at the end of the thirteenth and beginning of the fourteenth century, probably in the Karamanid state in south-central Anatolia. The Shi'a influence, on the other hand, can be seen extensively in the tradition of the aşıks, or ozans, who are roughly akin to medieval European minstrels and who traditionally have had a strong connection with the Alevi faith, which can be seen as something of a homegrown Turkish variety of Shi'a Islam. However, in Turkish culture such a neat division into Sufi and Shi'a is scarcely possible; Yunus Emre is considered by some to have been an Alevi, while the entire Turkish aşık/ozan tradition is permeated with the thought of the Bektashi Sufi order, which is itself a blending of Shi'a and Sufi concepts. The word aşık (literally, "lover") is in fact the term used for first-level members of the Bektashi order. The Turkish folk literature tradition extends in a more or less unbroken line from about the tenth or eleventh century to today. It is composed of three basic genres: epic, folk poetry, and folklore. The Turkish epic has its roots in the Central Asian epic tradition that gave rise to the Book of Dede Korkut, written in a language recognizably similar to modern Turkish and which developed from the oral traditions of the Oghuz Turks, that branch of the Turkic peoples which migrated towards western Asia and eastern Europe through Transoxiana beginning in the ninth century. The Book of Dede Korkut continued to survive in the oral tradition after the Oghuz Turks had, by and large, settled in Anatolia. The Book of Dede Korkut was the primary element of the Turkish epic tradition in Anatolia for several centuries. Another epic circulating at the same time, however, was the so-called Epic of Köroğlu, which concerns the adventures of Rüşen Ali ("Köroğlu," or "son of the blind man") to exact revenge for the blinding of his father. The origins of this epic are somewhat more mysterious than those of the Book of Dede Korkut. Many believe it to have arisen in Anatolia sometime between the fifteenth and seventeenth centuries; more reliable testimony though, seems to indicate that the story is nearly as old as that of the Book of Dede Korkut–dating from around the dawn of the eleventh century. Complicating matters somewhat is the fact that Köroğlu is also the name of a poet of the aşık/ozan tradition. That the epic tradition in Turkish literature may not have died out entirely can be seen from the Epic of Shaykh Bedreddin (Şeyh Bedreddin Destanı), published in 1936 by the poet Nâzım Hikmet Ran (1901–1963). This long poem, which concerns an Anatolian shaykh's rebellion against the Ottoman Sultan Mehmed I, is a sort of modern, written epic that nevertheless draws upon the same independent-minded traditions of the Anatolian people that can be seen in the Epic of Köroğlu. Also, many of the works of the twentieth-century novelist Yaşar Kemal (1923– ), such as his long 1955 novel Memed, My Hawk (İnce Memed), can be considered modern prose epics. The folk poetry tradition in Turkish literature, as indicated above, was strongly influenced by the Islamic Sufi and Shi'a traditions. Furthermore, as partly evidenced by the prevalence of the still existent aşık/ozan tradition, the dominant element in Turkish folk poetry has always been song. The development of folk poetry in Turkish, which began to emerge in the thirteenth century with such important writers as Yunus Emre, Sultan Veled, and Şeyyâd Hamza, was given a great boost when, on May 13, 1277, Karamanoğlu Mehmet Bey declared Turkish the official state language of Anatolia's powerful Karamanid state. Subsequently, many of the tradition's greatest poets would continue to emerge from this region. Much of the poetry and song of the aşık/ozan tradition, almost exclusively oral until the nineteenth century, remains anonymous. There are, however, a few well-known aşıks from before that time whose names have survived together with their works. These include the aforementioned Köroğlu (sixteenth century), Karacaoğlan (1606?–1689? ), who may be the best-known of the pre-nineteenth century aşıks, Dadaloğlu (1785?–1868? ), who was one of the last of the great aşıks before the tradition began to dwindle somewhat in the late nineteenth century, and several others. The aşıks were essentially minstrels who travelled through Anatolia performing their songs on the bağlama, a mandolin-like instrument whose paired strings are considered to have a symbolic religious significance in Alevi/Bektashi culture. Despite the decline of the aşık/ozan tradition in the nineteenth century, it experienced a significant revival in the twentieth century thanks to such outstanding figures as Aşık Veysel Şatıroğlu (1894–1973), Aşık Mahzuni Şerif (1938–2002), Neşet Ertaş (1943– ), and many others. The explicitly religious folk tradition of tekke literature shared a similar basis with the aşık/ozan tradition in that the poems were generally intended to be sung, generally in religious gatherings, making them somewhat akin to Western hymns (Turkish ilahi). One major difference from the aşık/ozan tradition, however, is that from the very beginning the poems of the tekke tradition were written down. This was because they were produced by revered religious figures in the literate environment of the tekke, as opposed to the milieu of the aşık/ozan tradition, where the majority could not read or write. The major figures in the tradition of tekke literature are: Yunus Emre (1240?–1320? ), who is one of the most important figures in all of Turkish literature, Süleyman Çelebi (?–1422), who wrote a highly popular long poem called Vesîletü'n-Necât (وسيلة النجاة "The Means of Salvation," but more commonly known as the Mevlid), concerning the birth of the Islamic prophet Muhammad, Kaygusuz Abdal (1397–? ), who is widely considered the founder of Alevi/Bektashi literature, and Pir Sultan Abdal (?–1560), whom many consider to be the pinnacle of that literature. The tradition of folklore—folktales, jokes, legends, and the like—in the Turkish language is very rich. Perhaps the most popular figure in the tradition is the aforementioned Nasreddin (known as Nasreddin Hoca, or "teacher Nasreddin," in Turkish), who is the central character of thousands of jokes. He generally appears as a person who, though seeming somewhat stupid to those who must deal with him, actually proves to have a special wisdom all his own. One day, Nasreddin's neighbor asked him, "Teacher, do you have any forty-year-old vinegar? "—"Yes, I do," answered Nasreddin.—"Can I have some?" asked the neighbor. "I need some to make an ointment with. "—"No, you can't have any," answered Nasreddin. "If I gave my forty-year-old vinegar to whoever wanted some, I wouldn't have had it for forty years, would I?" Similar to the Nasreddin jokes, and arising from a similar religious milieu, are the Bektashi jokes, in which the members of the Bektashi religious order, represented through a character simply named Bektaşi, are depicted as having an unusual and unorthodox wisdom, one that often challenges the values of Islam and of society. Another popular element of Turkish folklore is the shadow theater centered around the two characters of Karagöz and Hacivat, who both represent stock characters. Karagöz, who hails from a small village, is something of a country bumpkin, while Hacivat is a more sophisticated city-dweller. Popular legend has it that the two characters are actually based on two real persons who worked either for Osman I, the founder of the Ottoman dynasty, or for his successor Orhan I, in the construction of a palace or possibly a mosque at Bursa in the early fourteenth century. The two workers supposedly spent much of their time entertaining the other workers, and were so funny and popular that they interfered with work on the palace, and were subsequently beheaded. Supposedly, however, their bodies then picked up their severed heads and walked away. The two primary streams of Ottoman written literature are poetry and prose. Of the two, poetry—specifically, Divan poetry—was by far the dominant stream. Until the nineteenth century, Ottoman prose did not contain any examples of fiction; that is, there were no counterparts to, for instance, the European romance, short story, or novel (though analogous genres did, to some extent, exist in both the Turkish folk tradition and in Divan poetry). Similarly, "the world" refers simultaneously to the physical world and to this physical world considered as the abode of sorrow and impermanence, while "the rosegarden" refers simultaneously to a literal garden and to the garden of Paradise. "The nightingale," or suffering lover, is often seen as situated, both literally and figuratively, in "the world," while "the rose," or beloved, is seen as being in "the rosegarden." Here, the nightingale is only implied (as the poet/lover), while the rose, or beloved, is shown to be capable of inflicting pain with its thorns (خار hâr). The world, as a result, is seen as having both positive aspects (it is a rosegarden, and thus analogous to the garden of Paradise) and negative aspects (it is a rosegarden full of thorns, and thus different to the garden of Paradise). As for the development of Divan poetry over the more than 500 years of its existence, (a study, as the Ottomanist Walter G. Andrews points out, this is still in its infancy) clearly defined movements and periods have not yet been assigned. Early in the history of the tradition, the Persian influence was very strong, but this was mitigated somewhat through the influence of poets such as the Azerbaijani Nesîmî (?–1417?) and the Uyghur Ali Şîr Nevâî (1441–1501), both of whom offered strong arguments for the poetic status of the Turkic languages as against the much-venerated Persian. 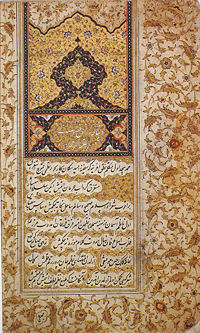 Partly as a result of such arguments, Divan poetry in its strongest period, from the sixteenth to the eighteenth centuries, came to display a unique balance of Persian and Turkish elements, until the Persian influence began to predominate again in the early nineteenth century. The vast majority of Divan poetry was lyric in nature: either gazels (which make up the greatest part of the repertoire of the tradition), or kasîdes. There were, however, other common genres, most particularly the mesnevî, a kind of verse romance and thus a variety of narrative poetry; the two most notable examples of this form are the Leylî vü Mecnun (ليلى و مجنون) of Fuzûlî and the Hüsn ü Aşk (حسن و عشق; "Beauty and Love") of Şeyh Gâlib. Until the nineteenth century, Ottoman prose never managed to develop to the extent that contemporary Divan poetry did. A large part of the reason for this was that much prose was expected to adhere to the rules of sec' (سجع, also transliterated as seci), or rhymed prose, a type of writing descended from the Arabic saj' and which prescribed that between each adjective and noun in a sentence, there must be a rhyme. By the early nineteenth century, the Ottoman Empire had become moribund. Attempts to right this situation had begun during the reign of Sultan Selim III, from 1789 to 1807, but were continuously thwarted by the powerful Janissary corps. As a result, only after Sultan Mahmud II had abolished the Janissary corps in 1826 was the way paved for truly effective reforms (Ottoman Turkish: تنظيمات tanzîmât). These reforms finally came to the empire during the Tanzimat period of 1839–1876, when much of the Ottoman system was reorganized along largely French lines. The Tanzimat reforms "were designed both to modernize the empire and to forestall foreign intervention". the introduction into Ottoman literature of previously unknown genres. Our language is not Ottoman; it is Turkish. What makes up our poetic canon is not gazels and kasîdes, but rather kayabaşıs, üçlemes, and çöğürs, which some of our poets dislike, thinking them crude. But just let those with the ability exert the effort on this road [of change], and what powerful personalities will soon be born! At the same time as this call, which reveals something of a burgeoning national consciousness, was made, new literary genres were being introduced into Ottoman literature, primarily the novel and the short story. This trend began in 1861, with the translation into Ottoman Turkish of François Fénelon's 1699 novel Les aventures de Télémaque, by Yusuf Kâmil Pasha, Grand Vizier to Sultan Abdülaziz. What is widely recognized as the first Turkish novel, Taaşuk-u Tal'at ve Fitnat (تعشق طلعت و فطنت; "Tal'at and Fitnat In Love") by Şemsettin Sami (1850–1904), was published just ten years later, in 1872. The introduction of such new genres into Turkish literature can be seen as part of a trend towards Westernization that continues to be felt in Turkey to this day. Due to historically close ties with France, strengthened during the Crimean War of 1854–1856, it was French literature that came to constitute the major Western influence on Turkish literature throughout the latter half of the ninteenth century. As a result, many of the same movements prevalent in France during this period also had their equivalents in the Ottoman Empire; in the developing Ottoman prose tradition, for instance, the influence of Romanticism can be seen during the Tanzimat period, and that of the Realist and Naturalist movements in subsequent periods. In contrast, the poetic tradition was influenced by the the rise of Symbolist and Parnassian movements. Many of the writers in the Tanzimat period wrote in several different genres simultaneously. The poet Nâmık Kemal (1840–1888) also wrote the important 1876 novel İntibâh (انتباه; "Awakening"), while the journalist Şinasi (1826–1871) is noted for writing, in 1860, the first modern Turkish play, the one-act comedy "Şair Evlenmesi" (اعر اعر اولنمسى; "The Poet's Marriage"). In a similar vein, the novelist Ahmed Midhat Efendi (1844–1912) wrote important novels in each of the major movements: Romanticism (حسن ملاح ياخود سر ايچيكده اسرار Hasan Mellâh yâhud Sırr İçinde Esrâr, 1873; "Hasan the Sailor, or The Mystery Within the Mystery"), Realism (هﻨﻮز اون يدى يشکده Henüz On Yedi Yaşında, 1881; "Just Seventeen Years Old"), and Naturalism (مشاهدات Müşâhedât, 1891; "Observations"). This diversity was, in part, due to the Tanzimat writers' wish to disseminate as much of the new literature as possible, in the hopes that it would contribute to a revitalization of Ottoman social structures. The Edebiyyât-ı Cedîde, or "New Literature," movement began with the founding in 1891 of the magazine Servet-i Fünûn (ﺛﺮوت ﻓﻨﻮن; "Scientific Wealth"), which was largely devoted to intellectual and scientific progress along the Western model. Accordingly, the magazine's literary ventures, under the direction of the poet Tevfik Fikret (1867–1915), were geared towards creating a Western-style "high art" in Turkey. The poetry of the group, of which Tevfik Fikret and Cenâb Şehâbeddîn (1870–1934) were the most influential proponents, was heavily influenced by the French Parnassian movement and the so-called "Decadent" poets. The group's prose writers, on the other hand, were primarily influenced by Realism, particularly Halid Ziya Uşaklıgil (1867–1945) although the writer Mehmed Rauf (1875–1931) did write the first Turkish example of a psychological novel, Eylül (ايلول; "September" 1901). The language of the Edebiyyât-ı Cedîde movement remained strongly influenced by Ottoman Turkish. In 1901, as a result of the article "Edebiyyât ve Hukuk" (ادبيات و ﺣﻘﻮق; "Literature and Law"), translated from French and published in Servet-i Fünûn, the pressure of censorship was brought to bear and the magazine was closed down by the government of the Ottoman sultan Abdülhamid II. Though it was closed for only six months, the group's writers each went their own way in the meantime, and the Edebiyyât-ı Cedîde movement came to an end. In the February 24, 1909 edition of the Servet-i Fünûn magazine, a gathering of young writers, soon to be known as the Fecr-i Âtî ("Dawn of the Future") group, released a manifesto in which they declared their opposition to the Edebiyyât-ı Cedîde movement and their adherence to the credo, "Sanat şahsî ve muhteremdir" (صنعت شخصى و محترمدر; "Art is personal and sacred"). Though this credo was little more than a variation of the French writer Théophile Gautier's doctrine of "l'art pour l'art," or "art for art's sake," the group was nonetheless opposed to the blanket importation of Western forms and styles, and essentially sought to create a recognizably Turkish literature. The Fecr-i Âtî group, however, never made a clear and unequivocal declaration of its goals and principles, and so lasted only a few years before its adherents each went their own individual way. The two outstanding figures to emerge from the movement were, in poetry, Ahmed Hâşim (1884–1933), and in prose, Yakup Kadri Karaosmanoğlu (1889–1974). In 1908, Sultan Abdülhamid II had instituted a constitutional government, and the parliament subsequently elected was composed almost entirely of members of the Committee of Union and Progress (also known as the "Young Turks"). The Young Turks (ژون تورکلر Jön Türkler) had opposed themselves to the increasingly authoritarian Ottoman government, and soon came to identify themselves with a specifically Turkish national identity. Along with this notion developed the idea of a Turkish and even pan-Turkish nation (Turkish: millet), and so the literature of this period came to be known as "National Literature" (Turkish: millî edebiyyât). It was during this period that the Persian- and Arabic-inflected Ottoman Turkish language was definitively turned away from as a vehicle for written literature, and that literature began to assert itself as being specifically Turkish, rather than Ottoman. At first, this movement crystallized around the magazine Genç Kalemler (کنج قلملر; "Young Pens"), which was begun in the city of Selânik in 1911 by the three writers who were most representative of the movement–Ziya Gökalp (1876–1924), a sociologist and thinker, Ömer Seyfettin (1884–1920), a short-story writer, and Ali Canip Yöntem (1887–1967), a poet. In Genç Kalemler's first issue, an article entitled "New Language" (Turkish: "Yeni Lisan") pointed out that Turkish literature had previously looked for inspiration either to the East as in the Ottoman Divan tradition, or to the West as in the Edebiyyât-ı Cedîde and Fecr-i Âtî movements, without ever turning to Turkey itself. This latter was the National Literature movement's primary aim. The intrinsically nationalistic character of Genç Kalemler, however, quickly took a decidedly chauvinistic turn, and other writers, many of whom, like Yakup Kadri Karaosmanoğlu, had been a part of the Fecr-i Âtî movement, began to emerge from within the matrix of the National Literature movement to counter this trend. Some of the more influential writers to come out of this less far-rightist branch of the National Literature movement were the poet Mehmet Emin Yurdakul (1869–1944), the early feminist novelist Halide Edip Adıvar (1884–1964), and the short-story writer and novelist Reşat Nuri Güntekin (1889–1956). Following the Ottoman Empire's defeat in the First World War of 1914–1918, the victorious Entente Powers began the process of carving up the empire's lands and placing them under their own spheres of influence. In opposition to this process, the military leader Mustafa Kemal (1881–1938), in command of the growing Turkish national movement whose roots lay partly in the Young Turks, organized the 1919–1923 Turkish War of Independence. This war ended with the official ending of the Ottoman Empire, the expulsion of the Entente Powers, and the founding of the Republic of Turkey. The literature of the new republic emerged largely from the pre-independence National Literature movement, with its roots simultaneously in the Turkish folk tradition and in the Western notion of progress. One important change to Turkish literature was enacted in 1928, when Mustafa Kemal initiated the creation and dissemination of a modified version of the Latin alphabet to replace the Arabic-based Ottoman script. Over time, this change, together with changes in Turkey's system of education, would lead to more widespread literacy in the country. Stylistically, the prose of the early years of the Republic of Turkey was essentially a continuation of the National Literature movement, with Realism and Naturalism predominating. This trend culminated in the 1932 novel Yaban ("The Wilds"), by Yakup Kadri Karaosmanoğlu. This novel can be seen as the precursor to two trends that would soon develop: social realism, and the "village novel" (köy romanı). The social realist movement is perhaps best represented by the short-story writer Sait Faik Abasıyanık (1906–1954), whose work sensitively and realistically treats the lives of cosmopolitan Istanbul's lower classes and ethnic minorities, subjects which led to some criticism in the contemporary nationalistic atmosphere. The tradition of the "village novel," on the other hand, arose somewhat later. As its name suggests, the "village novel" deals, in a generally realistic manner, with life in the villages and small towns of Turkey. The major writers in this tradition are Kemal Tahir (1910–1973), Orhan Kemal (1914–1970), and Yaşar Kemal (1923– ). Yaşar Kemal, in particular, has earned fame outside of Turkey not only for his novels, many of which, such as 1955's İnce Memed ("Memed, My Hawk"), elevate local tales to the level of epic, but also for his firmly leftist political stance. In a very different tradition, but evincing a similar strong political viewpoint, was the satirical short-story writer Aziz Nesin (1915–1995). A contemporary of the social realist and "village novel" traditions, the novelist Ahmet Hamdi Tanpınar (1901–1962) was an important essayist and poet as well. He wrote a number of novels, such as Huzur ("Tranquillity," 1949) and Saatleri Ayarlama Enstitüsü ("The Time Regulation Institute," 1961), which dramatize the clash between East and West in modern Turkish culture and society. Similar problems are explored by the novelist and short-story writer Oğuz Atay (1934–1977). Unlike Tanpınar, however, Atay, in such works as his long novel Tutunamayanlar ("Losers," 1971–1972) and his short story "Beyaz Mantolu Adam" wrote in a more modernist and existentialist vein. On the other hand, Onat Kutlar's İshak ("Isaac," 1959), comprised of nine short stories which are written mainly from a child's point of view and are often surrealistic and mystical, represent a very early example of magic realism. The tradition of literary modernism also informs the work of novelist Adalet Ağaoğlu (1929– ). Her trilogy of novels collectively entitled Dar Zamanlar ("Tight Times," 1973–1987), for instance, examines the changes that occurred in Turkish society between the 1930s and the 1980s in a formally and technically innovative style. Orhan Pamuk (1952– ), winner of the 2006 Nobel Prize in Literature, is another such innovative novelist, though his works, such as 1990's Beyaz Kale ("The White Castle") and Kara Kitap ("The Black Book") and 1998's Benim Adım Kırmızı ("My Name is Red"), are influenced more by postmodernism than by modernism. This is true also of Latife Tekin (1957– ), whose first novel Sevgili Arsız Ölüm ("Dear Shameless Death," 1983) shows the influence not only of postmodernism, but also of magic realism. In the early years of the Republic of Turkey, there were a number of poetic trends. Authors such as Ahmed Hâşim and Yahyâ Kemâl Beyatlı (1884–1958) continued to write important formal verse whose language was, to a great extent, a continuation of the late Ottoman tradition. By far the majority of the poetry of the time, however, was in the tradition of the folk-inspired "syllabist" movement (Beş Hececiler), which had emerged from the National Literature movement and which tended to express patriotic themes couched in the syllabic meter associated with Turkish folk poetry. The first radical step away from this trend was taken by Nâzım Hikmet Ran, who during his time as a student in the Soviet Union from 1921 to 1924 was exposed to the modernist poetry of Vladimir Mayakovsky and others, which inspired him to start writing verse in a less formal style. At this time, he wrote the poem "Açların Gözbebekleri" ("Pupils of the Hungry"), which introduced free verse into the Turkish language for essentially the first time. Much of Nâzım Hikmet's poetry subsequent to this breakthrough would continue to be written in free verse, though his work exerted little influence for some time due largely to censorship of his work owing to his Communist political stance, which also led to his spending several years in prison. Over time, in such books as Simavne Kadısı Oğlu Şeyh Bedreddin Destanı ("The Epic of Shaykh Bedreddin, Son of Judge Simavne," 1936) and Memleketimden İnsan Manzaraları ("Human Landscapes from My Country," 1939), he developed a voice simultaneously proclamatory and subtle. Another revolution in Turkish poetry came about in 1941 with the publication of a small volume of verse preceded by an essay and entitled Garip ("Strange"). The authors were Orhan Veli Kanık (1914–1950), Melih Cevdet Anday (1915–2002), and Oktay Rifat (1914–1988). Explicitly opposing themselves to everything that had gone in poetry before, they sought instead to create a popular art, "to explore the people's tastes, to determine them, and to make them reign supreme over art". To this end, and inspired in part by contemporary French poets like Jacques Prévert, they employed not only a variant of the free verse introduced by Nâzım Hikmet, but also highly colloquial language, and wrote primarily about mundane daily subjects and the ordinary man on the street. The reaction was immediate and polarized; most of the academic establishment and older poets vilified them, while much of the Turkish population embraced them wholeheartedly. Though the movement itself lasted only ten years, until Orhan Veli's death in 1950, after which Melih Cevdet Anday and Oktay Rifat moved on to other styles, its effect on Turkish poetry continues to be felt today. Just as the Garip movement was a reaction against earlier poetry, in the 1950s and afterwards there was a reaction against the Garip movement. The poets of this movement, soon known as İkinci Yeni ("Second New"), opposed themselves to the social aspects prevalent in the poetry of Nâzım Hikmet and the Garip poets, and instead—partly inspired by the disruption of language in such Western movements as Dada and Surrealism—sought to create a more abstract poetry through the use of jarring and unexpected language, complex images, and the association of ideas. To some extent, the movement can be seen as bearing some of the characteristics of postmodern literature. The most well-known poets writing in the "Second New" vein were Turgut Uyar (1927–1985), Edip Cansever (1928–1986), Cemal Süreya (1931–1990), Ece Ayhan (1931–2002), Sezai Karakoç (1933- ) and İlhan Berk (1918– ). Outside of the Garip and "Second New" movements also, a number of significant poets have flourished, such as Fazıl Hüsnü Dağlarca (1914– ), who wrote poems dealing with fundamental concepts like life, death, God, time, and the cosmos; Behçet Necatigil (1916–1979), whose somewhat allegorical poems explore the significance of middle-class daily life; Can Yücel (1926–1999), who in addition to his own highly colloquial and varied poetry was also a translator into Turkish of a variety of world literature; and İsmet Özel (1944– ), whose early poetry was highly leftist but whose poetry since the 1970s has shown a strong mystical and even Islamist influence. ↑ Originally, the term ozan referred exclusively to the bards of the Oghuz Turks, but after their settlement in Anatolia and the rise of Shi'a Islam, ozan and aşık became interchangeable terms. ↑ Karamanoğlu Mehmet Bey's declaration is as follows: Şimden gerü dîvânda, dergâhta, bârgâhta, mecliste ve meydanda Türkçeden başka dil kullanılmayacaktır ("From this day forward, no language other than Turkish will be used in the court, in the tekke, in the palace, in the government, or in public") (Selçuk Üniversitesi Uzaktan Eğitim Programı (SUZEP). As a measure of the extent of the influence against which Karamanoğlu Mehmet Bey was fighting, his declaration itself contains three words of Arabic origin (دیوان dîvân or "court," مجلس meclis or "government," and ميدان meydân or "public") and two of Persian origin (درگاه dergâh or "tekke" and بارگاه bârgâh or "palace"). ↑ One apparent exception was the Muhayyelât (مخيّلات "Fancies") of Ali Aziz Efendi of Crete, a collection of stories of the fantastic that was written in 1796, though not published until 1867. ↑ Kayabaşı, üçleme, and çöğür were all seen as part of the Turkish folk tradition: a kayabaşı was a sort of rural ballad or shepherd's song; an üçleme was a three-part tale or narrative song; and a çöğür was a mandolin-like musical instrument associated with the aşık/ozan tradition. ↑ "Bizim dilimiz Osmanlıca değil, Türkçedir. Şiirimizde divanları dolduran gazelle kaside değil, bazılarının vezinsiz diye beğenmedikleri 'kayabaşı', 'üçleme' ve 'çöğür'lerdir. İstidat sahiplerimiz hele bu yola bir kere himmet etsinler, az vakitte ne kudretli şahsiyetler yetişir." Seyit Kemal Karaalioğlu, (ed.) Ziya Paşa: Hayatı ve Şiirleri. (İstanbul: İnkılâp ve Aka Basımevi, 1984), 39. ↑ There had actually been, according to Gonca Gökalp, five other earlier or contemporaneous works of fiction that were clearly distinct from earlier prose traditions in both Divan and folk literature, and that approximate novelistic form. Among these five works is the Muhayyelât of Ali Aziz Efendi, cited above. Another, 1851's Akabi Hikâyesi ("Akabi's Story"), written by the Armenian Vartan Pasha (Hovsep Vartanian) using the Armenian script and for an Armenian audience was, according to Andreas Tietze, "the first genuine modern novel written and published in Turkey", cited in G. Gonca Gökalp, "Osmanlı Dönemi Türk Romanının Başlangıcında Beş Eser." in Hacettepe Üniversitesi Edebiyat Fakültesi Dergisi, 185–202. Retrieved February 18, 2009. 188). ↑ Viz. Elif Şafak's characterization of Ömer Seyfettin's story "Primo Türk Çocuğu" ("Primo: The Turkish Lad"), Şafak 2005. ↑ Toby Lester, July 1997, New-Alphabet Disease?. first published in Atlantic Monthly Retrieved April 29, 2009.; Ernest Wolf-Gazo, John Dewey in Turkey: An Educational Mission. Journal of American Studies of Turkey 3 (1996): 15-42. Retrieved April 29, 2009. ↑ Sylvia Paskin, The Cloak of love. The Guardian(UK), September 24, 2005, Retrieved April 29, 2009. ↑ "Man in a White Coat", 1975. Retrieved February 19, 2009. ↑ Earlier poets, such as Ahmed Hâşim, had experimented with a style of poetry called serbest müstezâd ("free müstezâd"), a type of poetry which alternated long and short lines of verse, but this was not a truly "free" style of verse insofar as it still largely adhered to prosodic conventions (Mehmet Fuat, 2002 . Retrieved April 29, 2009. ↑ Talat Sait Halman, (ed. & trans.). "Introduction". Just for the Hell of It: 111 Poems by Orhan Veli Kanık. (Multilingual Yabancı Dil Yayınları, 1997. ISBN 9789757262138). ↑ The Garip movement was considered to be the "First New" (Birinci Yeni). Andrews, Walter G. Ottoman Lyric Poetry: An Anthology. Austin: University of Texas Press, 1997. ISBN 0292704720. Andrews, Walter G. Poetry's Voice, Society's Song. Seattle: University of Washington Press, 1985. ISBN 0295961538. Belge, Murat. Osmanlı'da Kurumlar ve Kültür. İstanbul: İstanbul Bilgi Universitesi Yayınları, 2005. ISBN 975899803X. Fuat, Mehmet, ed. 2002. "Nâzım Hikmet: Life Story". Tr. Nurgül Kıvılcım Yavuz. Retrieved February 18, 2009. Gökalp, G. Gonca. "Osmanlı Dönemi Türk Romanının Başlangıcında Beş Eser" in Hacettepe Üniversitesi Edebiyat Fakültesi Dergisi, 185–202. Retrieved February 18, 2009. Lester, Toby. 1997. "New-Alphabet Disease?". Retrieved February 18, 2009. Mansel, Philip. Constantinople: City of the World's Desire, 1453–1924. New York: St. Martin's Press, 1996. ISBN 0140262466. Moran, Berna. Türk Romanına Eleştirel Bir Bakış. Vol. 1. Cağaloğlu, İstanbul: İletişim Yayınları, -1994. ISBN 9754700540. Muhtar, İbrahim et al. 2003. "Genç Kalemler". Retrieved February 18, 2009. Pala, İskender. Divân Şiiri Antolojisi: Dîvânü'd-Devâvîn. Kızılay, Ankara: Akçağ Yayınları, 1995. ISBN 975338081X. Paskin, Sylvia. 2005. "The cloak of love". Retrieved February 18, 2009. Selçuk Üniversitesi Uzaktan Eğitim Programı (SUZEP). "Türk Yazı Dilinin Tarihî Gelişimi". Retrieved February 18, 2009. Şafak, Elif. 2005. "There Is No Clash of Civilizations". Retrieved February 18, 2009. Şentürk, Ahmet Atilla. Osmanlı Şiiri Antolojisi. İstanbul: YKY, 1999. ISBN 9750801636. Wolf-Gazo, Ernest. 1996. "John Dewey in Turkey: An Educational Mission". Retrieved February 18, 2009. This page was last modified on 23 December 2015, at 22:30.